Sarepta Therapeutics got some great news from the FDA yesterday that sent shares soaring. Here's why the stock is definitely worth a deeper dive by risk-tolerant investors. Sarepta Therapeutics (NASDAQ:SRPT) is a clinical-stage biopharma developing a potentially game-changing treatment for Duchenne muscular dystrophy, or DMD, called eteplirsen. Eteplirsen is an exon-skipping therapy designed exclude a frame-shifting mutation at exon 51 in order to restore expression of a key protein, dystrophin, deficient in young boys afflicted with DMD. Although this therapy would only be able to address about 13% of the DMD population, eteplirsen's success on the clinical and regulatory fronts could open the door for a host of additional exon-skipping drugs indicated for another 67% of the boys living with this devastating disease. The good news is that yesterday the Food and Drug Administration, or FDA, agreed to allow Sarepta to finally submit a regulatory filing for eteplirsen. As a refresher, the FDA previously said that such a filing would be "premature" because the drug has only completed a small midstage study. The agency, later on, even questioned the validity of some of the study's findings in terms of dystrophin restoration in patients receiving the drug. So, I don't think it's an exaggeration to say that this thawing of the relationship between Sarepta and the FDA is a big deal. In fact, my belief is that this news represents a golden opportunity for investors to buy into a grossly undervalued biotech that is about to skyrocket. Here's why. Back in 2013, the market valued Sarepta at nearly $2 billion because it believed that eteplirsen was closing in on a regulatory approval with the FDA. After the FDA rejected Sarepta's request for an accelerated review, shares plummeted to about where they are trading right now, giving the biotech a market cap of less than $1 billion. So, recent history certainly suggests that Sarepta's market cap could more than double from current levels. But what really matters is eteplirsen's value proposition at this stage in the game. With that in mind, I think there are a couple of fairly good reasons to believe this single drug could propel Sarepta's shares much higher. When considering eteplirsen's value proposition, the first thing to understand is it can be dosed at significantly higher levels than its chief rival drisapersen -- that is also under review with the FDA and presently owned by BioMarin (NASDAQ:BMRN). What this means is that eteplirsen has a decent shot at being the far more potent of the two drugs. In terms of commercial potential, the Street believes that eteplirsen's peak sales could reach $500 million with little to no effort on the marketing front. Because the drug is already well-known within the DMD community, it would basically sell itself, helping the company to save hundreds of millions on marketing costs typical of most other drug launches. Perhaps most importantly, though, eteplirsen would validate Sarepta's remaining DMD platform that, in total, should be able to generate sales that exceed $2 billion. Another key issue is that eteplirsen is indicated for a rare disease and has been granted orphan drug status by the FDA. It would therefore have numerous commercial advantages over traditional drugs, if approved, such as an extended period of exclusivity, a premium pricing structure, little pushback from payers, high penetration rates, tax advantages, among many others. And that's why the market absolutely loves rare disease drugmakers. Orphan drugmakers such as Alexion Pharmaceuticals, BioMarin, Isis Pharmaceuticals, among others, for instance, all trade at more than 10 times their annual revenues. 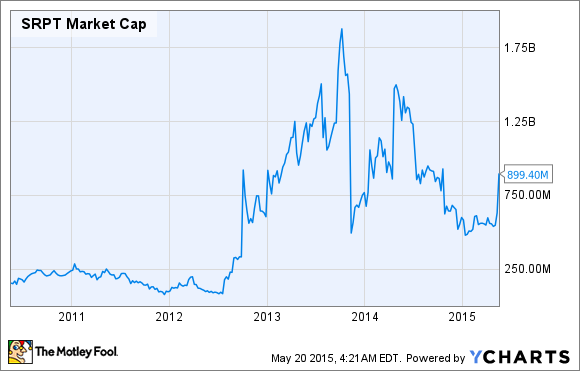 Is Sarepta a screaming buy right now? The biggest risk facing the company is obviously eteplirsen's upcoming regulatory review. And there's no telling how this pivotal event will ultimately turn out. That said, I think the FDA is going to be hard pressed by DMD advocates and specialists treating the disease to approve at least one of these exon-skipping therapies currently under review (eteplirsen and drisapersen). Given that eteplirsen looks like the better drug from both an efficacy and safety standpoint, and the agency would have the ability to pull the drug if it fails a late-stage study down the road, I'm cautiously optimistic that Sarepta will finally see its much-maligned DMD drug win the backing of the FDA before year's end. That's why I'm going to start buying shares of Sarepta ahead of eteplirsen's regulatory review and hold them for the long-haul.